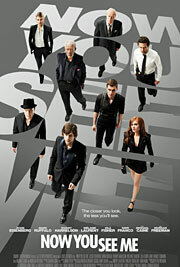 It takes balls of steel to write a film like “Now You See Me.” It’s the screenwriter declaring to the moviegoing public that he or she is smarter than they are, which motivates the audience to prove them wrong. Now, to be fair to the screenwriters of this particular film, anyone who says they figured out the ending before the Big Reveal just got lucky. At the same time, there are a lot of things about the movie that are a little…off, and not in a ‘this is a clue in disguise’ kind of way. The characters themselves tell you that you’re too close to see the big picture. As it turns out, the movie is the same way. It’s a thrill to watch while it’s happening, but take a step back when the credits roll, and it reveals itself to be a house of cards. J. Daniel Atlas (Jesse Eisenberg), Henley Reeves (Isla Fisher), Merritt McKinney (Woody Harrelson) and Jack Wilder (Dave Franco) are talented illusionists with varying degrees of success – a couple of them are actually cons – when they receive a mysterious invitation to meet in an abandoned building. One year later, they are performing together in Las Vegas as the Four Horsemen, and they execute a dazzling stunt that involves robbing a bank halfway around the world. This, naturally, attracts the attention of both the FBI and Interpol, which leads to cynic Fed Dylan Rhodes (Mark Ruffalo) being teamed up with French desk jockey Alma Day (Melanie Laurent). Watching from the sidelines with bemusement is Thaddeus Bradley (Morgan Freeman), an illusionist who has made a career out of debunking other illusionists. Rhodes isn’t sure whether he is trustworthy or another piece in a larger puzzle.